There is no such thing as a ‘good’ terrorist, and we call on other nations not to show their political ambitions while fighting with terrorism, Russian Foreign Minister Sergey Lavrov said during a Paris conference on Iraq. The participants have agreed to offer Iraq “appropriate military aid,” according to the final conference statement. Participants have agreed to offer Iraq “appropriate military aid,” according to the final conference statement. It wasn’t immediately clear what kind of military aid was meant. The statement added that dealing with the IS is “a matter of urgency." Around 30 countries took part in the event. Lavrov has criticized the move not to invite Syria and Iran to the meeting. “Syria and Iran are our natural allies in the fight against IS, and their participation in today’s meeting could significantly enrich our work. Moral standards on which the anti-terrorism battle is based shouldn’t become vague,” he stated. Lavrov also stated that the IS is evidently planning to “edge the whole region of the Middle East into the abyss of religious wars,” enlisting their crimes. He spoke out harshly against all the activities of IS which “threaten the future of Iraq,” with “death and destruction” spilling into Syria as well. Aggressive actions by the terrorist organization which calls itself ‘Islamic State’ threaten the future of Iraq. Extremists bring death and destruction to the neighboring Syria as well. Lavrov also stated that the IS is evidently planning to “edge the whole region of the Middle East into the abyss of religious wars,” by listing their crimes. “They murdered and humiliate Christians, stage horrific executions of journalists. 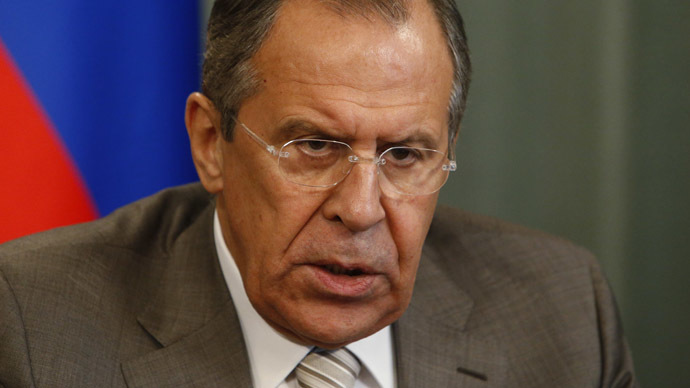 They try to impose on Muslims an unacceptable attitude to other confessions and to the entire world,” Lavrov said. The minister expressed a strong point of view regarding the IS ambitions for independence. “The IS commanders should have no illusions: they do not represent Islam and they would never be allowed to create their state,” he said. Finally, Lavrov expressed Russia’s readiness to participate in the development of additional measures for fighting terrorism. “We already provide significant military and other necessary help to strengthen the anti-terrorism potential of Iraq, Syria and other states in the region which are on the frontline in their fight against the IS,” he said.